One of my favorite things last year was attending the (In)RL conference AT MY HOUSE! I have always wanted to go to a conference for me. Non work related but for me. For my personal growth. And last year I had the chance. And I didn't have to go anywhere. I was able to attend from the comfort of my house. I had planned to actual have a get together around it but there were so many conflicting events that weekend that I ended up attending alone. And I learned a lot. I was inspired and I walked away a better person. This year the conference is FREE! (Last year it was $10). AND registration opens up TODAY!!!!!! With FREE gifts! So not only do you get an amazing day of your favorite bloggers and authors you also get a FREE calendar. This year I am again planning on hosting a get together at my home complete with coffee and chocolate! And gifts. I already have people coming and I am ready. I can't wait to share this amazing experience with them. So don't hestitate. You don't have to go anywhere. 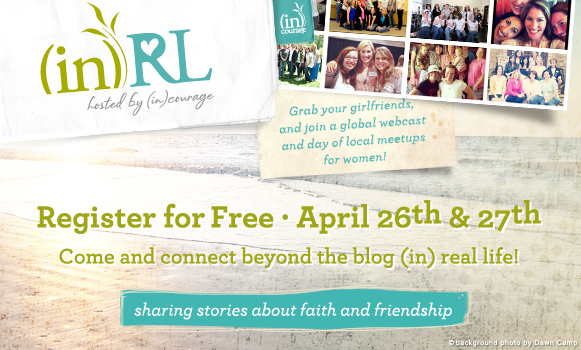 Just grab your laptop and sit on your couch and join thousands of woman all over the world as we talk about what it takes to stay rooted in community.Just click on the picture above and sign up! Consider hosting your own get together or finding one in your area. After all we all need community.